It’s finally here! Ahhh, Spring. Thoreau welcomed it, writing that it was when the Earth began to “stretch itself.” Shakespeare said it put the “spirit of youth in everything.” And they didn’t even have to endure months of inside recesses and telling students to STAY OFF THE ICE! 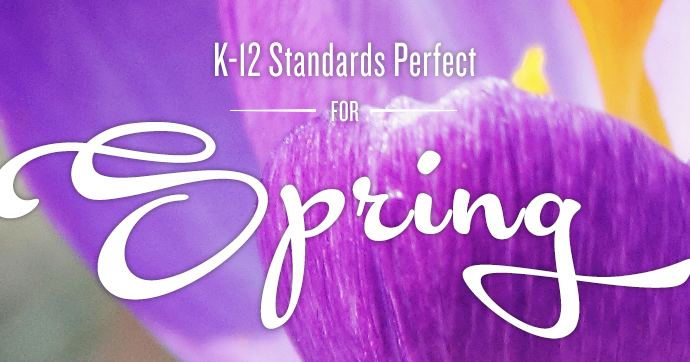 So shake off those winter layers, revel in the glimmers of sunshine before the morning bell, and welcome the warmer weather with K-12 standards from across the country that are perfect for spring. 8.3.2.1.1 Explain how the combination of the Earth’s tilted axis and revolution around the sun causes the progression of seasons. SC2.4.3.a Observe that the sun provides heat and light. 2.6 identify, build, describe, measure, and analyze mechanical systems (e.g., simple and complex compound machines) and describe the forces acting. 1.4 Practice aerobic activities in real-world settings. S1E1 Students will observe, measure, and communicate weather data to see patterns in weather and climate. MS-ESS.H Water influences weather and weather patterns through oceanic, atmospheric and land circulation. PS.FM.CE.1.2.2 Friction is a force that opposes sliding between two surfaces. DA.68.H.1.2 Research and discuss the influence that social dances have had on the development of classical, theatrical, modern, and contemporary dance genres. PH.7 The student will investigate and understand properties of fluids. Key concepts include a) density and pressure; b) variation of pressure with depth; c) Archimedes’ principle of buoyancy; d) Pascal’s principle; e) fluids in motion; and f) Bernoulli’s principle. With MasteryConnect you can track student learning of these standards—actually any standard—with our web-based platform. See how you we help you identify student levels of understanding so you can target intervention and inform instruction. Learn more.